Trolls Bridge is a popular SlotsBaby game from the well known developer Yggdrasil, and is based around a fantasy adventure theme. The trolls in the title are the game’s main characters, with various versions of them cropping up on the game’s five reels and 20 paylines. If you are a keen player of online slots games, you may well have come across it before. Other symbols used include cauldrons of bubbling potion and golden treasures. Play it today on one of the best slot sites uk. If you are familiar with told Nordic folktale ‘The Three Billy Goats Gruff’ then you should already have a fairly good idea about the storyline of this game. There are some typically Yggdrasil features in the game, including the high-quality graphics and the ample range of genuinely appealing bonuses. Free Spins symbols are worth looking out for, as, if you spin in three or more of them on the reels you are taken into Free Spins Mode. There, you can obtain three to six bonus feature picks. There are four types of wilds in the game, all represented by wooden shields. These shields will substitute any other symbol to bring in wins on any payline. 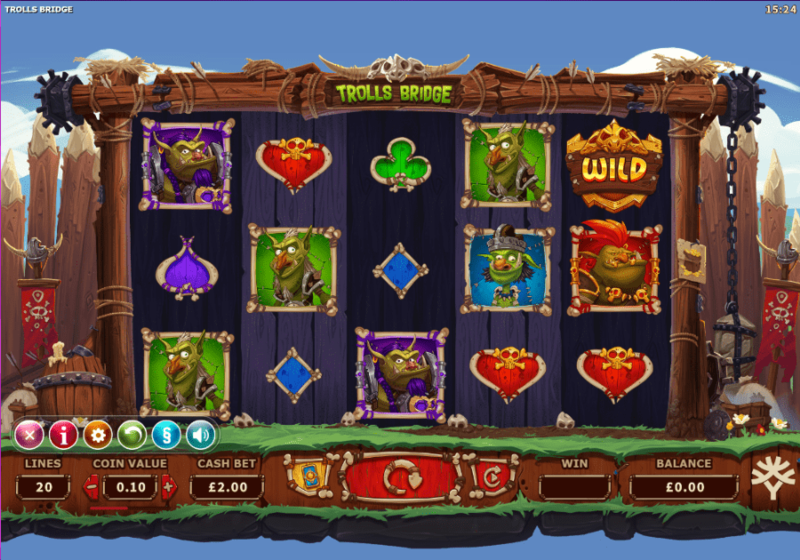 The Troll Wild offers free spins and the Random Wild gives you a single free spin. You can also play using the Golden Bet feature to obtain an extra pick in free spin mode. You will need to spend a little bit of extra cash to unlock this feature, though. The game’s Bonus Pot symbol can only land on reel five, but it does offer you access to features and instant coin prizes, as well as free spins. Play today at Sbaby. Founded in 2013, Yggdrasil has rapidly established itself as one of the most respected and trusted brands in slots online gaming. The company, now based in Malta, has picked up a number of prized industry awards for its work. The most recent of these was the International Gaming Awards prize for Innovator of the Year in 2018. It supplies a wide range of slots online games to many of the biggest names in the betting industry. One of Yggdrasil’s quirks is that they like to incorporate a little touch of genuine game playing into their offerings, rather than just leaving them as basic slots games. 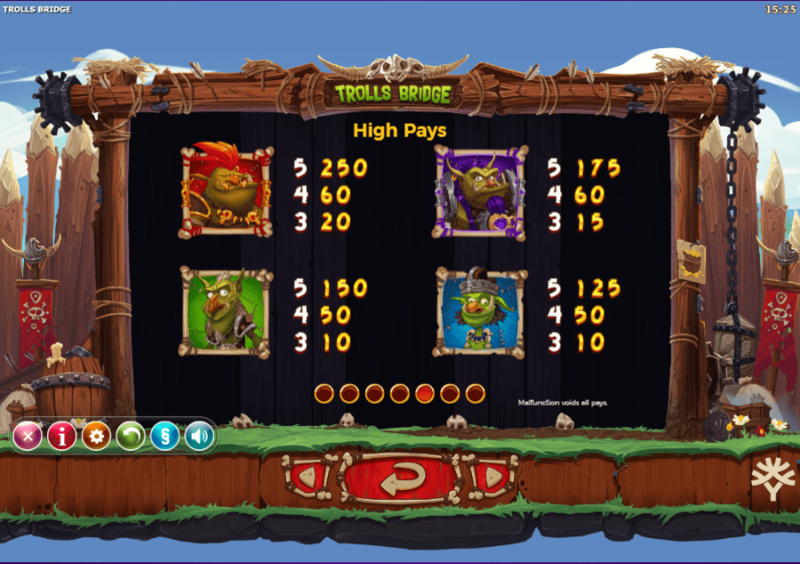 To do well at Trolls Bridge, you may need to have a little more gaming skill than just letting the reels spin. In conclusion, Trolls Bridge offers plenty of entertainment and fun to fans of fruit machines, and it is well worth looking out for this game in your favourite online casino. With a Return to Player percentage of 96.3 percent, playing the game can potentially be quite rewarding too. High-quality graphics and music help to create the typically immersive atmosphere you usually find in Yggdrasil free online slot games with bonus rounds. This is a slots game that is well playing, next time you see it in an online UK casino.